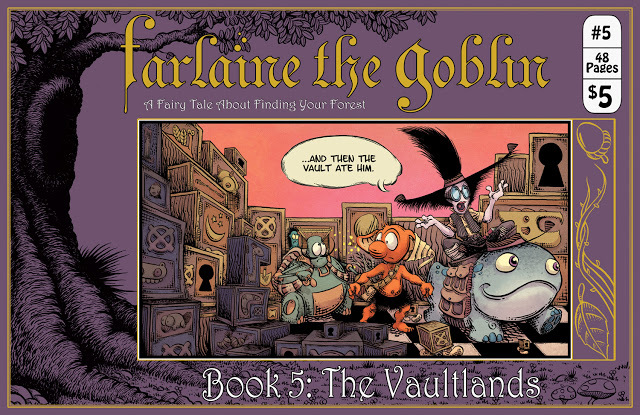 Farlaine the Goblin Book 5: The Vaultlands Review – AiPT! Pug Grumble’s Farlaine the Goblin Book 5: The Vaultlands features cute character designs and creative fantasy concepts. Is it good? The books in this series follow the eponymous goblin and his friends as they explore a variety of fantasy lands. It’s a classic, effective set-up; there’s an overarching narrative to provide a sense of cohesion, but each adventure also works as a standalone that introduces new lore to the series. I had not read any previous volumes in the series before reading this one, and that didn’t hurt my comprehension of its events at all. Grumble does a good job of giving the reader any necessary information without making the writing feel cumbersome or weighed down by exposition. The concept behind the Vaultlands is a neat one. Farlaine and his friends find themselves exploring a landscape of vaults which vary in size, shape, appearance, and lock mechanisms. Some vaults contain single rooms while others contain vast landscapes. It’s a worlds-within-a-world concept, and Grumble sells it effectively. Part of the fun in reading this book is that, like the protagonists, the reader doesn’t know what’s coming next. One aspect of the book that readers can count on being consistent is the artwork. Simply put, Grumble’s style in adorable. This is an all-ages appropriate title and the artwork reflects that, but it doesn’t sacrifice detail or charm in order to do so. There’s a lot going on here that is impressive, and Grumble’s use of perspective is especially skillful. The cartoony character designs are also a lot of fun, and they really match the tone of the book. In terms of cons, my main issues with the book are minor gripes with a few transitional scenes. There are some brief occasions where characters’ behaviors strike me as odd within the larger narrative context, but nothing is ever jarring enough to be too big of a problem. There are also some panels here and there where I’m not quite sure what is happening do the artwork being somewhat unclear. This doesn’t happen very frequently however, and most of the book is easy to follow and narratively well put together. Overall, this is a fun volume. Minus some occasional and minor exceptions, the writing is consistently smooth throughout, and the artwork is both child-friendly and impressively detailed. Grumble doesn’t spoon-feed his lore to the reader, but rather drops them right in the thick of things and lets them to explore alongside the characters. It’s a fitting approach for these characters, and the execution of the narrative is admirable. A mixture of interesting fantasy concepts and adorable yet detailed artwork makes this book a great time.